I’m not sure why cosmetic companies like to change names and packaging in different regions. It might have been targeted marketing in the past, but in the Age of the Web it just impedes social/viral marketing as it unnecessarily confuses and segments people. 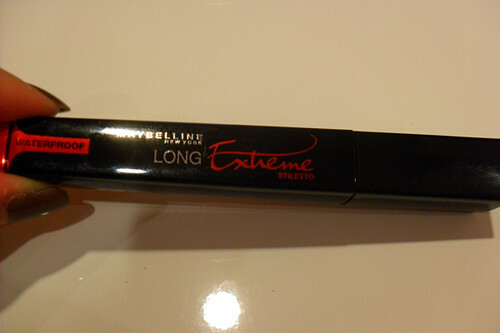 Whatever it is called in your area, the mascara I’ve just started trying out is Maybelline Long Extreme Name - I mean - Stiletto Mascara. And I’m going to give it a firm thumbs-down. It applies fine initially, but it dries way too fast for you to do any building, and I had such a hard time trying to comb my lashes out after that with a spoolie brush, because the mascara was SOOO stiff I couldn’t run the bristles through my hairs. It also doesn’t lengthen or voluminize well, which means it’s pretty blah for a company that engineered so much hype about another of its mascaras. And it’s also one of those annoying mascaras that tries to build onto the ends of your lashes for length, but fails because somehow the formula and the brush makes the false “lash tips” bend in every direction but up. While it’s not expensive, it’s definitely not worth the money for me. Next time, I’ll heed the warnings on Makeupalley. Good If: You are the type that wants to just sweep mascara over your lashes once or twice and go. Bad If: You like to work at your lashes, and build up or comb out your mascara.